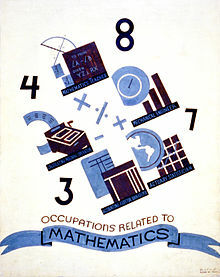 A mathematician is a person whose primary area of study and research is the field of mathematics. Mathematicians are used to game-playing according to a set of rules they lay down in advance, despite the fact that nature always writes her own. One acquires a great deal of humility by experienceing the real wiliness of nature. Quapropter bono christiano, sive mathematici, sive quilibet impie divinantium... cavendi sunt, ne consortio daemoniorum irretiant. Translation: Therefore, a good Christian should beware that mathematicians, and any others who prophesy impiously... may be entangled in the companionship of demons. Augustine uses "mathematicians" in this context to refer mainly to astrologers and occultists using numerology. Popularly attributed to Paul Erdős, who was quoting Alfréd Rényi (Bruce Schechter, My Brain Is Open: The Mathematical Journeys of Paul Erdős, 1998, New York: Simon & Schuster, ISBN 0684846357). Die Mathematiker sind eine Art Franzosen; redet man zu ihnen, so übersetzen sie es in ihre Sprache, und dann ist es alsobald ganz etwas anders. Translation: Mathematicians are [like] a sort of Frenchmen; if you talk to them, they translate it into their own language, and then it is immediately something quite different. Quoted in N. Rose Mathematical Maxims and Minims, Raleigh NC:Rome Press Inc., 1988. Edward Norton Lorenz (1991) "A scientist by choice". Speech by acceptance of the Kyoto Prize in 1991. Plato, from Benjamin Jowett's interpretive vernacular translation (1871) of Plato's Republic, Book VII, 531-e. Plato actually has Socrates say that few mathematicians are dialecticians (διαλεκτικοί) (Jowett, Plato's Republic: The Greek Text, Vol. I "Text", 1894), by which he refers to step by step reasoning based on mutual agreement, (G. M. A. Grube, Plato's Republic (1974), Book VII, note 13). It is an accurate observation on the primitive mathematics of his day.